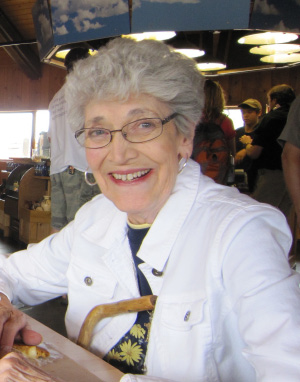 Virginia Lorraine Lindsay, 89, of Lyons, passed away January 25, 2019 at Pleasant View Home, of Inman. She was born August 31, 1929 in Dover, Oklahoma, the daughter of Eber and Wilma Rudd Prater. She graduated from Potwin High School with the class of 1947, and later attended Butler Community College for one year. Virginia has resided in Lyons since 1998, formerly of Hutchinson. She had also resided in Garden City, KS, Hill City, KS, Potwin, KS, and Cheyenne, WY. She was a telephone operator for Southwestern Bell in Potwin, KS and Cheyenne, WY, and worked in the meat department for Schultz Fine Foods in Hill City, KS. Virginia also worked as a sales associate for Montgomery Ward in Hill City. Virginia was a member of the Potwin Christian Church, Hill City Christian Church, Crossroads Christian Church in Hutchinson, and attended First Presbyterian Church in Lyons. She was also a member of the Heliantha Club in Hill City. She was a homemaker as well as being an accomplished seamstress and a wonderful gardener. On August 7, 1950, Virginia was united in marriage with Millard Lindsay in Potwin, KS. He preceded her in death on December 29, 2010. She is also preceded in death by her parents; and daughter, Dana Roth. She is survived by her two sons, Mike Lindsay of Lyons, KS, and Scott Lindsay and wife Charlene of Fort Collins, CO; son-in-law, David Roth of Lyons; sister, Mary Lou Proffitt of St. Charles, MO; five grandchildren, Kendra Kanduch, Megan Lindsay, Ashley Roth, Kalie Leiker and Leah Bowers; six great-grandchildren. Funeral service will be 2:00 P.M., Saturday, February 2, 2019 at Birzer Funeral Home, Lyons with Pastor Wayne Pittman officiating. Burial will be at Lyons Municipal Cemetery. Memorials may be given to First Presbyterian Church of Lyons, KS, or the Dana Roth Scholarship Fund in care of Birzer Funeral Home, Lyons.